The spread of suburbia into the countryside after the postwar housing shortage became a defining feature of the Australian way of life. The ideology of 1950s suburban togetherness fermented the psyche of those who inhabited the endless stretches of fibro and brick veneer, with their laminex surfaces and mod cons. As Gertrude Stein said of suburbia ‘there’s no there there’. Yet behind the triple-fronted brick veneer walls and underlying the fantasy of ‘Better Homes & Gardens’, lay a reality for many of childhood boredom, marital tension, isolation and conservatism. Australian artists (except perhaps John Brack and Barry Humphries) have by and large disregarded suburbia, gravitating instead to, and thriving in, the city’s mean streets. Or, like Fred Williams, they took off for the bush to paint rural landscapes. Or to the desert, like Russell Drysdale and Sidney Nolan. But suburbia was not ignored by Howard Arkley, who would collect out-of-register colour pages from outdated magazines, or lovingly ponder different ways of rendering woodgrain surfaces or rug patterns with his reverberating airbrush. Beginning as an abstract painter in the 1970s, then turning to figurative painting in the 1980s, Arkley reconciled the two tendencies in his distinctive take on the suburban motif. By 1983, at Tolarno Galleries in Melbourne, he began his first domestic interior paintings (‘Suburban interior’). In 1987 and 1988 he focused on the external appearance of brick veneer (‘Suburban exterior’). Arkley’s signature style was this combination of the literal with the psychedelic, the deadpan with the incandescent, turning real-estate into something like unreal-estate. George Alexander, Contemporary: Art Gallery of New South Wales Contemporary Collection , 'Popism and screen culture', pg.204-245, Sydney, 2006, 210, 211 (colour illus.). Fiona Barbouttis, Foundation Newsletter #24 , 'CCB comes of age', pg. 6-7, Sydney, Jul 2014, 6, 7 (colour illus.). Jane Hampson, Look , 'Home show in Venice', pg. 12-13, Melbourne, Jul 1999, 12 (colour illus.). Lisa-Marie Murphy, Look , 'Building the Gallery's collection', pg. 33-34, Sydney, Mar 2015, 34. 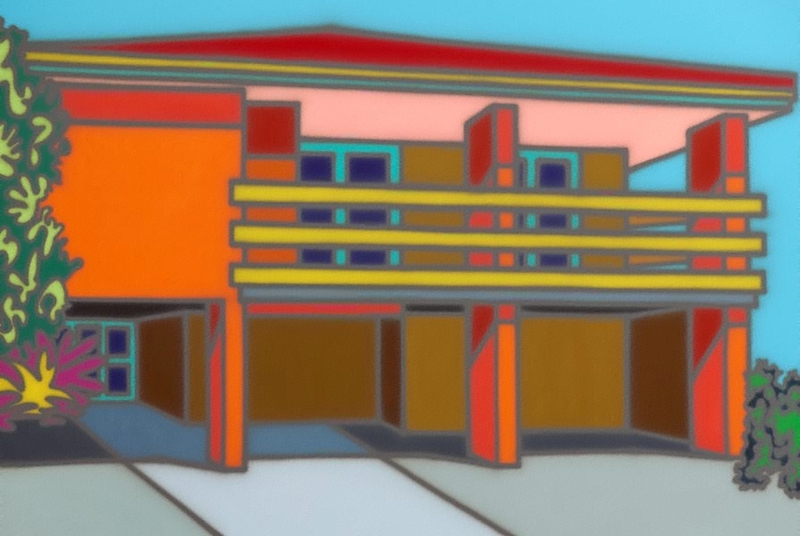 Jason Smith, Howard Arkley , Melbourne, 2006, 21 (colour illus.). Judith White, Look , 'Vital signs', pg.38-39, Melbourne, Apr 2000, 38 (colour illus.). Art Gallery of New South Wales annual report 1999 , 'Collections: International Modern and Contemporary Art', pg. 21, Sydney, 1999, 21, 22 (colour illus. ).